University of Alabama sophomore quarterback Tua Tagovailoa (Ewa Beach, Hawaii) has been selected as the 2018 Walter Camp Player of the Year. The Walter Camp Player of the Year is voted on by the nation’s 130 Football Bowl Subdivision head coaches and sports information directors. Other finalists for the 2018 Walter Camp Player of the Year award included quarterbacks Kyler Murray (Oklahoma), Will Grier (West Virginia) and Gardner Minshew (Washington State) and linebacker Josh Allen (Kentucky). The 52nd recipient of the Walter Camp Player of the Year award, Tagovailoa is the second Crimson Tide player to win the prestigious honor, joining running back Derrick Henry (2015). Overall, Tagovailoa is the 20th quarterback to earn the award. Tagovailoa is also the eighth player from a SEC school to win the award. 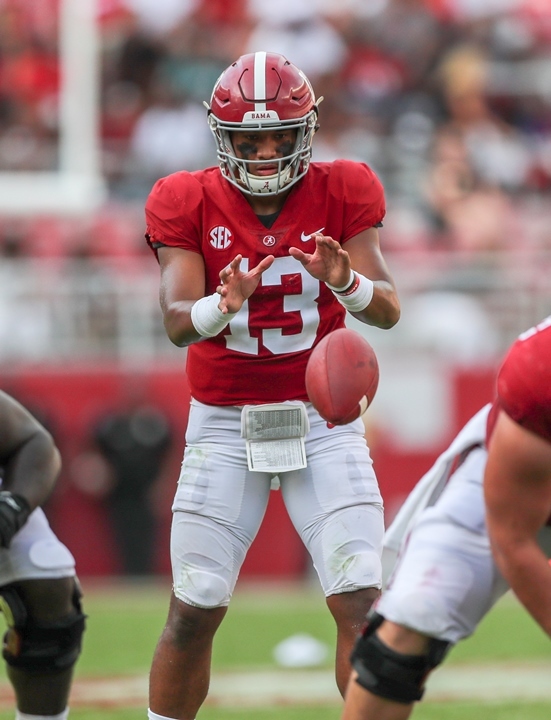 Tagovailoa has been a standout for the Southeastern Conference champion and top-ranked Crimson Tide (13-0), who will face #4 Oklahoma in the semifinals of the College Football Playoff on December 29 at the Capital One Orange Bowl in Miami Gardens, Fla.
A dynamic dual-threat quarterback, Tagovailoa has thrown for 3,353 yards and a school-record 37 touchdowns with just four interceptions on 199-of-294 passing (67.7 percent) this season. He has also rushed for five touchdowns. Tagovailoa ranks second in the nation in passer efficiency rating (202.3) and he guides the nation’s No. 2 scoring offense at 47.9 points per game. The sophomore is tied for second on the UA career touchdown pass list with 48 and has thrown for 300 or more yards a school-record five times this season. His 42 combined passing and rushing touchdowns are also a UA season record. Tagovailoa, along with members of the 2018 Walter Camp All-America team, and other major award winners (Distinguished American-Archie Manning; Man of the Year-Mike Golic; Perseverance Award-Jake Olson, USC), will be honored at the organization’s national awards banquet, presented by David McDermott Lexus of New Haven, on Saturday, January 12, 2019 at Yale University’s Lanman Center in New Haven.